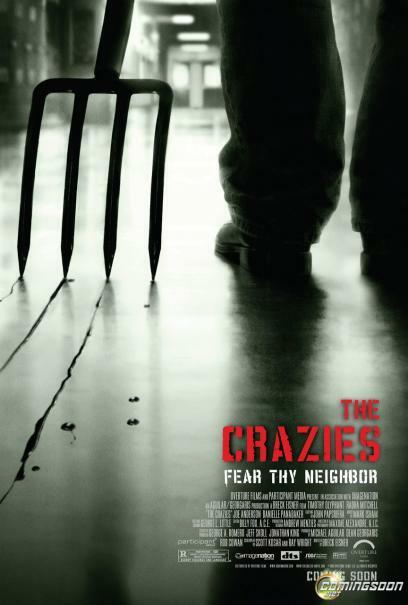 Did you ever see the move The Crazies? It’s about a small Iowa town that was suddenly plagued by insanity and then death after a mysterious toxin contaminates their water supply. It’s not that great of a movie. Maybe worth a rental at the ole Red Box. However, I am not here talking about a movie. The whole point for this comparison is that we really do have some crazies among us. Who knows if it’s from the water or what but they are definitely crazy and they probably want to eat your face.I am talking about the psychos from the WBC (Westboro Baptist Church). Maybe you have heard of them. Or maybe you were like me and didn’t know a damn thing about them. I had heard about Elizabeth Edwards death in the beginning of this month. She has passed from breast cancer. She was well-known due to her former husband, John Edwards. I then heard that this “church” would be protesting at her funeral. Have you ever in your life heard of such a thing? Never, right? So I decided to look into the WBC organization and see what they were about. Googling the organization was pretty interesting. I thought I had messed up with the name because it kept taking me to this website call (I can’t even bring myself to type it) godhatesfags.com. This was a church? Who the heck did they worship? Someone investigate their water. It looks brown! According to their website (I kid you not! ), they have began conducting “peaceful” protests opposing the gay lifestyle or how they put it “soul damning lifestyle, and filth”. Among the gays, they hate Jews, Muslims, Elizabeth Edwards, American soldiers, America, and pretty much everybody that walks the planet. They even have a picket schedule and an explanation of why they are picketing the particular place. 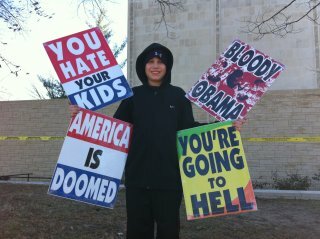 For example: Mulvane American Legion in Mulvane, KS December 14, 2010 : WBC will picket the Mulvane american legion. Mulvane is the birthplace of the so-called patriot guard. A bunch of smelly veterans who are on a mission to glorify themselves. There is nothing patriotic about a group of violent vets who claim to have fought for the rights of the people in this country and then do everything they can to try to keep you from using those rights. Guess what? You don’t give us those rights – GOD DOES! They apparently have something against odor too! They are so proud of themselves and profess to be the hand of God and his hatred towards “everyone”. 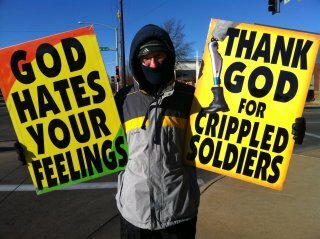 And they spare no expense no feelings when expressing God’s supposed hate toward everyone. So at Elizabeth Edwards’s funeral, they too showed no mercy.This brings vile to my mouth. To show someone they think they know anything about is disrespect. And at her own funeral! That’s what you call insane. Imagine Elizabeth’s young children were there and they may have witnessed this! Whatever Elizabeth believed or thought, or even had said in her life is no one’s business but her own. Who is anyone to judge? Yet how evil for this wicked church to bring such dishonor and lack of concern for her loved ones! I realize we live in America. Free expression, free speech, free will, free to worship whatever or whom ever. I hold these truths to as a writer. Yet, its one thing to use these with pride and it’s another to demerit the country that holds these creeds sacred. WBC , you are everything un-American. You are also everything un-holy. To say that there is a God that is full of hatred for everything he has created. Blasphemy anyone? I don’t know how you can sleep at night. I don’t know how you can look at yourselves in the mirror and be convinced that you are doing the right thing which is promoting division and hatred among people. The only logical reasoning I can think of is that you are delusional. You all have been drinking the most toxic kool-aid known! You believe to be “the world’s last hope.”I think you are really the last straw of why religion should be done away with completely. Are you related to the Osama Bin Ladin? If you are that crazy to attack people as viciously as you do, you must be a terrorist group. You’re website should be banned. You’re organization should not be allowed either. You teach hate! And now it’s only a matter of time, when your hatred becomes full force.Well folks, we really do have some real-life crazies in our hands. And if you’re ever traveling through Kansas, run! You might get pointed at as a hellion. WBC stated that they lose no sleep over what people think of them. Good for you!However, I lose no sleep knowing that everything you teach will come full circle on yourselves. Haughtiness, self-righteousness, and pride are all sins. Come to think of it, so is hate! That just sickens me! Just awful, how do people driving past witnessing their protests not jump out of the car and kick them in the teeth? Again, I ain’t a violence person but when you hear this … well its makes you wanna get violent! this was awesome I loved how u beat them back down. I’ve never heard of it either. Thats insane. I was like blown away when I heard these people. I was like say what?!?! 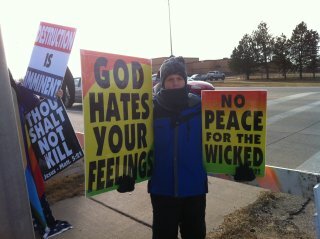 Isn’t this the same people who picketed Heath Ledger’s funeral with “he’s going to hell” signs too? STUPIDITY!!! That’s all I can say.